Mildura is not known for its opera scene. But it might gain an extra degree of cultural notoriety if Siobhan Stagg’s star continues to rise. I met Siobhan in mid-2012 when she performance at the Woodend Winter Arts Festival. The Festival’s Artistic Director, Jacky Ogeil, confided in me when she booked the 24-year-old: “Watch this one, she’s a find. She’s going places.” How right she was. By the time Siobhan arrived at the Festival, she had collected a swag of awards and honours, had just picked up a scholarship which would take her to the UK, and was considering offers from Paris and Berlin. Siobhan’s voice had already won her fans worldwide – including rave reviews of her performances at the Melbourne Recital Centre in June 2012. In 2011 she won First Prize and the Audience Choice Award in the prestigious Meistersinger Vocal Competition in Graz, Austria and featured on the debut album of Latitude 37 which was nominated for Best Classical Album in the 2011 ARIA Awards. She has performed with the Australian Brandenburg Orchestra in Sydney and Melbourne and the Melbourne Symphony Orchestra. She ultimately accepted a spot with the Deutsche Oper Berlin (Berlin Opera), which is where she is right now – completing a European summer season performing at the Salzburg Festival (Austria), after finishing her Masters in Cardiff at the Wales International Academy of Voice on the scholarship from the Australian International Opera Award. This Mildura girl is now calling Berlin, the capital with the reputation for being the hippest of cultural and creative centres, home. Such is the appetite that the word ‘more’ comes to mind – more performances, more variety, more performers, more opportunities and more work for aspirants like Siobhan. “I realised as soon as I arrived in Berlin that I am now part of a huge working machine that is an opera company,” she said. “It’s my responsibility to show up prepared and ready to do my best for the public on the stage, but the reality is that my part is just one tiny piece of a thousand piece puzzle, most of which is concealed behind the curtain. Enough opera performances in any single night to ensure not just an opera scene, but audiences with specific operatic tastes, and a high value placed on the singing form – relatively mysterious to most Australians (even those who pride themselves in being ‘cultured’). Siobhan’s observation is that it’s probably an inherited sensibility. The daughter of school teachers, Siobhan grew up in Mildura (where her parents still live & work), but music was not really a central part of her family life: “I was always singing but it was always just a hobby. Music (professionally) is new in my family. My brothers spent a lot of time during our childhood telling me to be quiet,” she laughs. Opera and the stage are a long way from early dreams of being a vet or taking up medicine – Siobhán’s older brother is a doctor and her younger brother is studying to be one. It was really only at about age 18, when Siobhán was exposed to her first orchestra and opera that her dream shifted. Classical training has enhanced Siobhán’s vocal ability in pop and musical theatre – which she also loves, but she is in awe of what beautiful classical performances can offer. And that beautiful angelic voice is getting a serious workout. 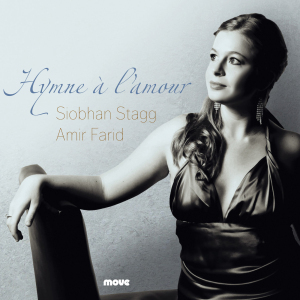 Siobhan’s CD, Hymne à l’amour was just been nominated for Best Classical Album in the 2013 Australian Independant Music Awards. Rarely lonely for company from home (rarely a week goes by without friends passing through on their own European adventure and angling for a tour of the opera house), Siobhán has returned home to Australia three times in the last 12 months – to debut with the Melbourne Symphony Orchestra singing Mahler Four at the Sidney Myer Music Bowl for an audience of 10,000; to perform in Christmas concerts, record her own album in Melbourne and release it in Melbourne in April this year). “I will probably stay based here in Europe for the next five years or so, with semi-regular trips home to Australia for work and to visit family. I’m in Europe now until June 2014, then back to Australia for performances in Adelaide, Melbourne, Perth and Hobart at the end of next year,” she said. When she’s here, don’t miss her. Siobhán Stagg of Mildura, Australia, lately of Berlin, and who knows where next. But it will surely be somewhere wonderful.